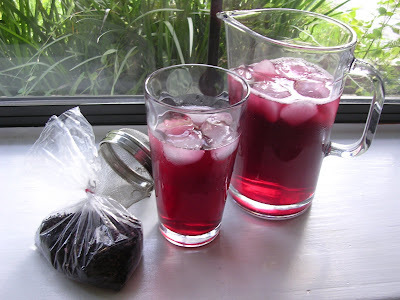 Recently I learned how to make a kind of hibiscus tea. The drink goes by several names - roselle, karkady, bissap, sorrel etc. - depending on where in the world you are drinking it. I was introduced to it as an agua fresca, which is a light refreshing not-too-sweet drink consumed in Mexico and Caribbean to reduce the effects of heat, both outside and from spicy food. The woman who served me my first glass told me it was "huh-mike-uh" tea, spelled like Jamaica but pronounced in a less Anglicized fashion. There are many kinds of aguas frescas and you can quickly find many recipes by doing a little googling, I mean searching, on the Web. After my first glass, I was hooked and immediately set about gathering the ingredients and recipes to make my own batch. The result was delicious, and I later learned, healthy. 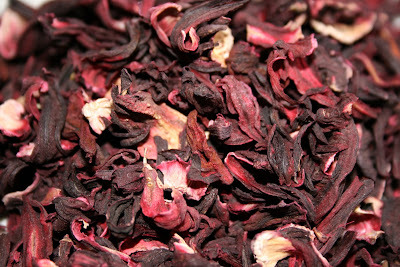 I purchased dried hibiscus (Hibiscus sabdariffa) at a local grocery in their bulk herbs section. Mexican groceries or Latin markets may also carry these dried flowers. I used demerara sugar, also from the grocery, because it has marvelous caramel undertones. The unrefined cane flavor adds to the tropical taste of the tea. Evaporated cane sugar or cane syrup could also be used, or maybe even brown sugar if you are really in the sticks. Add the water and sugar to a saucepan. Bring the water to a boil. Turn off heat. Put the hibiscus flowers in a large tea ball. Place the ball in the water. Cover and let steep for at least an hour or overnight. Remove the tea ball and chill the infusion. The resulting tea concentrate is slightly sweet and quite tart, I prefer mine watered down and on ice. The flavor is more like cranberry juice than a flowery brew like chamomile. When making the tea, you can skip the tea ball and just pour the flowers directly in the hot water. Just pass the resulting infusion through a fine strainer once its finished steeping. Be very careful with this tea! It will stain you, the counter, your clothes, the cat, anything that it touches. Thankfully, it does not stain teeth. Many recipes for Jamaica tea call for boiling the flowers, which I don't do. There is even a Food Network video here that demonstrates this method. I have cold extracted the flowers by adding the tea ball into a glass pitcher of water and letting it sit in the sun all day. The tea was lighter and less flavorful, and also less acidic. I have also increased the sugar, and the amount of water sometimes, to produce the tea that suited my needs for the day. I encourage anyone to play with the amounts to find their optimum infusion. While searching for recipes, I also found that fellow scientists are busy trying to prove that Jamaica tea is good for you, as well as refreshing to drink. There is published research about the benefits of drinking hibiscus tea in fighting high cholesterol (1) and blood pressure (2 or 3). 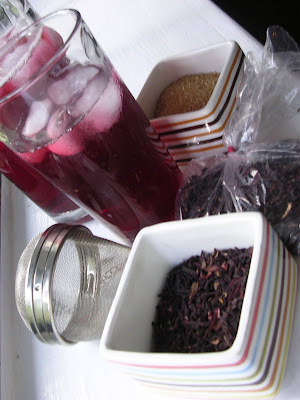 Hibiscus infusions have been used in many cultures folk medicine traditions around the world. The tea is loaded with Vitamin C and obviously antioxidants, given its deep red color. Commercially, Celestial Seasonings offers Red Zinger tea that contains hibiscus flowers, in case you just can't get it together to make Jamaica from scratch. Hopefully, you will give this delicious drink a chance and please let me know what you think or if you have a preparation or serving suggestion. According to online sources, ginger is a common additive and I believe that my next batch of Jamaica tea will feature fresh ginger slices also. Enjoy and have a good week! 2. Abstract 3278: Hibiscus sabdariffa L. Tea (Tisane) Lowers Blood Pressure in Prehypertensive and Mildly Hypertensive adults. DL McKay et al. Tufts Univ/HNRCA, Boston, MA. When I was a kid, my parents briefly enrolled me in a hippie run art school, and they would always tell us that hibiscus tea was a preventative cure all for just about any cold or flu ... so to this day I still pick up a pack of Red Zinger tea to keep around the house! Lots of websites agree with the hippies at the art school Adrienne! And if its on the Internet, it must be true...right? Or, it's a government conspiracy.